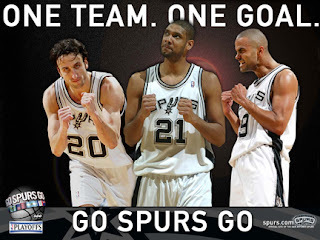 I'm really, really hooked on the San Antonio Spurs. They are one of the best basketball teams ever and it is thrilling to watch them play. So it really amazes me that they seem to be constantly dissed by the rest of the nation as either boring or now, in a bizarre flip-flop, as a team of thugs and cheaters. I guess when you have a reputation as "good guys" for as long as the Spurs have had, it doesn't take much for people to latch onto to turn that around quickly. It reminds me of the political hype from presidential campaigns where sweeping judgments and stereotypes of candidates are based on flimsy and sometimes false evidence. But all it takes is for the charge to get repeated enough times and it sticks. The Spurs remind me a lot of the 1998-2000 New York Yankees team I loved so much. They don't rely on a superstar to pull them through every game. Instead, they just play great as a team. What is so great about the Spurs team is that they have so much depth off of their bench. The team is naturally built around their superstar Tim Duncan. But they also have two other superstars in Tony Parker and Manu Ginobili who can carry the team if Duncan is having an off night. In addition, they have perhaps the best defensive player in the league in Bruce Bowen and then to top it off they have a whole bench full of key role players like Elston Howard and Fabarico Oberto to provide picks and blocks. But their secret weapon is the fact that they have no fewer than five guys who are absolutely deadly from the 3-point range: Michael Finley, Bruce Bowen, Robert Horry, Brent Barry and, of course, Manu Ginobili. When they start hitting their three-point shots, it doesn't take long for a close game to turn into a 12-15 point blowout. The Spurs just finished off the Phoenix Suns, who were probably the best team they will face in the playoffs. That means unless they fall apart and/or someone gets very lucky, they have a clear shot from here on out for their fourth NBA title. The Wall Street Journal had an interesting story the other day about a dispute between the Iraqi government and a Texas company hired to build an electric utility plant south of Baghdad. The plant is currently shuttered and unused with gleaming new equipment just collecting dust. The Texas company, Southeast Texas Industrial Services Inc., ran into lots of problems trying to fulfill the $283 million contract beginning with security issues. The construction site was the target of multiple insurgent attacks and the Iraqi government failed to provide effective security. In addition, the Iraqi government was constantly behind in making payments for the project almost from the beginning. Finally, when the Texas company was forced to spend millions providing their own private security in order to get the work done they were accused of cheating when they tried to pass those costs on to the Iraqi government. But what I found most interesting about the story was the role of the Bush administration via their representatives at the U.S. embassy in Baghdad. Who do you suppose they sided with in this dispute? The Iraqi government, of course. They accused the Texas company of being “unreliable” and “incompetent.” How’s that for an ironic twist. Of course, they can’t side against their puppet regime in Baghdad and any extra money that must be ponied up is ultimately going to come out of U.S. coffers in the end. So it is really no surprise that they would give the American company the back side of their hand in this dispute. The man who should be president has written a new book! A new study by a former FBI ballistics expert is casting fresh doubts on the Warren Commission's conclusion that John F. Kennedy was killed by a lone assassin. They found that the scientific and statistical assumptions Guinn used -- and the government accepted at the time -- to conclude that the fragments came from just two bullets fired from Oswald's gun were wrong. Eventually, the house of cards that the Warren Commission based its conclusions on will collapse and the officials who have been propping it up all this time will be forced to admit that there was more than one gunman (i.e. a conspiracy). An area the size of California in Antarctica melted in 2005. Vast areas of snow in Antarctica melted in 2005 when temperatures warmed up for a week in the summer in a process that may accelerate invisible melting deep beneath the surface, NASA said on Tuesday. A new analysis of satellite data showed that an area the size of California melted and then re-froze -- the most significant thawing in 30 years, the U.S. space agency said. I’m sure this is just more global warming alarmism. Nothing to see here. Not to worry. Go back to what you were doing. Never mind.